It has been pointed out to me, by several people, that I don’t know an ox from a buffalo. This is your chance to put me right and improve my knowledge of Greek beasts of burden. Hilary i am not an expert on bovine animals either but from childhood and what my mother used to say was that the oxen did all the hard work so I think photos 1, 2 and 4 are oxen but number 3 I don't know. I would like to know too if what I remember is correct. By the way my aunt, my mother's younger sister Never ate beef as a mark of respect for these hard working animals. Well Charithea no one else seems to know about Oxen and Buffalo so i will go with Oxen in future. I think you will like the photo I posted today of women winnowing the wheat to separate the grain from the chaff . I loved the story of you and your cousin standing on the threshing board . Hilary. My 'skinny' cousin is currently here on a 3 month long holiday. I shall show him your 'beasts of burden' posts and see if he can tell the difference. By the way he is not skinny anymore. I'm used to domestic cattle, Bos taurus, but mainly the breeds we have in the northern part of Europe. I have seen buffaloes a few times, but not handled them. I don't think they look like the the ones in your lovely photos, Hillary, although I can't say that I recognise the breed in photo 3. I have seen buffaloes a couple of times in northern Greece (near Lake Kerkini), I thought I had lots of photos of them, but I can only find this one. Absolutely recommended, Hillary. If you wish to see lots of birds, then go in the spring. My dictionary says that normally "oxen" means male cattle (usually castrated) used for carrying or hauling, or being fattened as food. But it adds that in the zoological sense it covers "any beast of the bovine family of ruminants, including the domestic European species, the 'wild oxen' preserved in certain parks in Britain, the buffalo, bison, gaur, yak, musk-ox etc". So everyone's right, and there's no need to know an ox from a bullock! All the 4 photos in the original post are of various types of domestic cattle, Bos taurus. 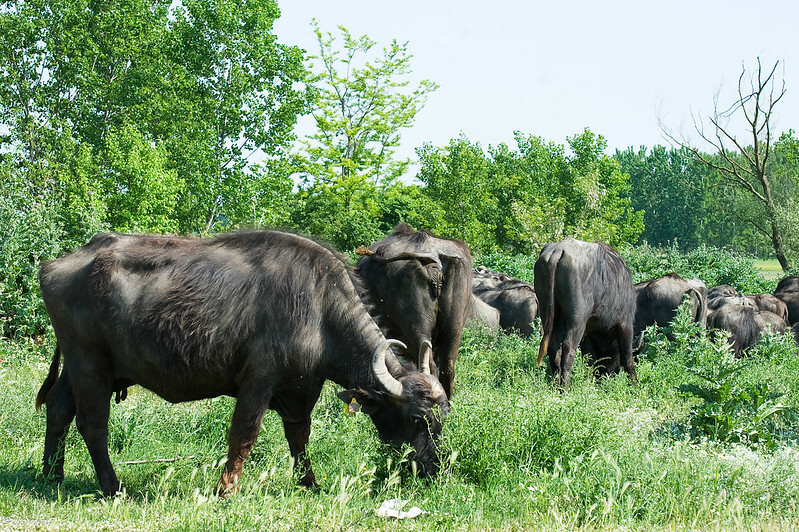 Jorun's photo is indeed of water buffalo, Bubalus bubalis, which are kept in Europe for their very rich milk to make mozzarella, and in Asia for ploughing paddy and being prodded around by small children. Small (300m2) south-facing garden on the outskirts of Málaga. RHS H2 / USDA 10b. I'm glad you agree with me, Pallas, I would have been embarrassed otherwise. Buffalo are very common around the Naples area in Italy where (got my vegan hat on now) they are not "beasts of burden" (name says it all!) but are unfortunately still exploited for milk production to make mozzarella. Photos taken in Sardinia last year at the parade to honour Saint Effisio, the patron saint of Cagliari. Not sure I'd class them as 'beasts of burden' but they were some of the biggest animals I've ever seen.